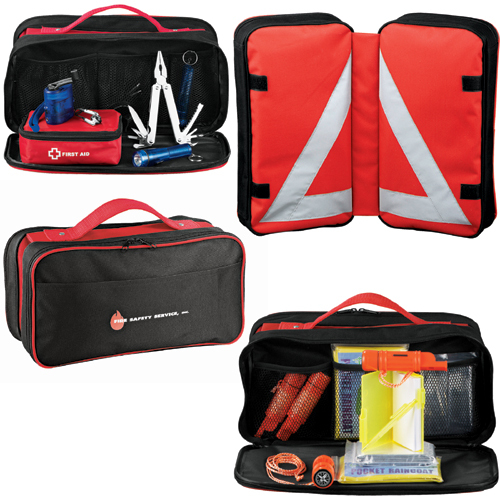 Associate your brand with safety with this deluxe emergency response kit. The 18-piece set includes four ponchos, two mylar blankets, a StaySafe Compact First Aid Kit (#1400-45), mobile phone rotary charger, two mini flashlights, jotter (4.125"H x 2.5"W), pen, four whistle navigators, PVC tape, multi-functional tool, and a portable case with an integrated reflective warning triangle. Custom Logo Imprinted StaySafe Emergency Response Family Bag. • Dimensions: 14"H x 2.5"W" x 15.5"L.